We just saw the first footage from Doctor Who's 50th anniversary here at Comic-Con. We expected hilarious banter between stars Matt Smith and David Tennant, and a haunting look at the forgotten Doctor John Hurt. But we got much, much more. The trailer starts out on a haunting, dark note — Matt Smith is walking in the TARDIS, while in voiceover he says, "I've had many faces. Many lives. I don't admit to all of them. There's one life I've tried very hard to forget." And we glimpse the Doctor talking to Clara about his greatest secret. And then — what looks like the Time War, between the Daleks and the Time Lords! Seriously. Daleks blowing up, flames everywhere, everything going to Hell. And in the middle of all the carnage, John Hurt as the non-Doctor, looking resolute. "Great men are forged in fire," he says. And then something about being the man who lit the flames. And then, we get Tennant and Smith. 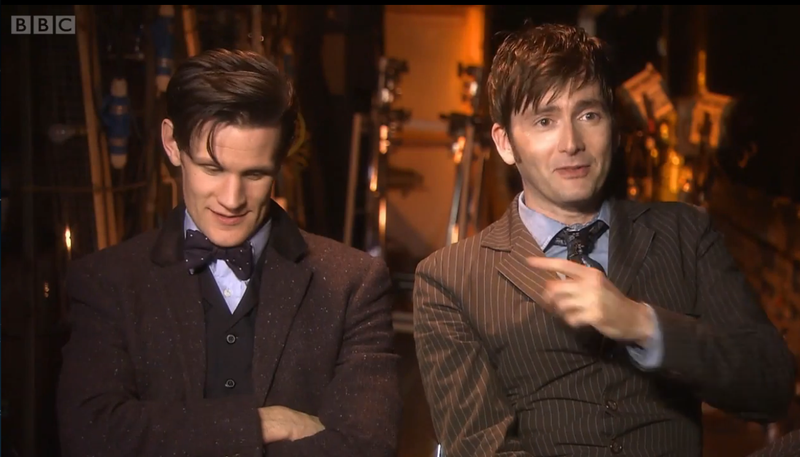 Tennant, in his TARDIS, yells "Allons-y," while Matt Smith, in his, yells "Geronimo!" Rose pops up and warns that "the moment is coming." And John Hurt's non-Doctor says that he is ready for what's going to happen. And then: the Tenth and Eleventh Doctors comparing their sonic screwdrivers, as Tennant looks possibly a bit jealous of Smith's screwdriver. And then a shot of both of them wearing clever glasses, while Smith wears his fez and they look delighted with their cool gear. And then a glimpse of Rose, looking excited. Oh, and the TARDIS being airlifted down to Trafalgar Square with the Doctor hanging down from it. Smith is in the TARDIS, when he says, "I remember this. I pretty much remember." And we see twinkly lights traveling across the Earth. David Tennant and John Hurt are inside Matt Smith's TARDIS. "Oh, you've redecorated. I don't like it," Tennant says, channeling Patrick Troughton in "The Three Doctors." A title appears: "This fall, the Doctor will face his darkest day: Himself." And we see Zygons, plural. Busting out of a glass case. And then some more shots of Daleks blowing up and being torn apart and generally being Da-wrecked. Inside the TARDIS, Tennant tells Smith, "For once, I would like to know where I'm going." Smith responds: "No, you really wouldn't." And then, someone says, "I'm looking for the Doctor." And the camera pans around to show Hurt, Tennant and Smith, with the two Doctors trying not to look at their unacknowledged predecessor. Tennant shrugs and says, "Well, you've certainly come to the right place." The actual Doctor Who panel in Hall H was pretty exciting — although producer Steven Moffat insisted he hasn't cast the next Doctor yet. The panel started with all the fans holding up their sonic screwdrivers en masse, for a glowy buzzing salute. And then a cool Eclectic Method music video featuring clips from the show's 50 years. And a "recap video" covering the show from 1963 to today, with a heavy emphasis on the past couple years. And finally, a trailer for Doctor Who: An Adventure in Time and Space, the docudrama about the making of the show. For anyone who's a fan of the early years of the show, just seeing the sets and costumes reproduced, and a fictionalized glimpse of the making of the show, including the making of "An Unearthly Child," "Dalek Invasion of Earth," and "The Tenth Planet." And you see Verity Lambert struggling with Sydney Newman's expectations of her "piss and vinegar" personality, plus William Hartnell (David Bradley) trying to hold it together and vainly hoping that they can't make the show without him. Also, Hartnell filming "The Edge of Destruction" and saying "Check the fornicator," instead of "fault locator." Oh, and we see Lambert pitching the show to Hartnell. The Doctor is "C.S. Lewis meets H.G. Wells meets Father Christmas." Hartnell says, "Doctor who?" Also, at the start of the panel, host Craig Ferguson won the crowd over by reciting Amy Pond's speech about her imaginary childhood friend who came back, and it's kind of awesome. He quipped, "The people who are waiting for the Sons of Anarchy panel are very confused." Steven Moffat rejects the notion that he was cruel in killing off Amy and Rory. "They died in their eighties, how much more merciful could I be? If serial killers did that it would be less bad, wouldn't it?" Someone asked Moffat how much planning has gone into the 50th anniversary, and he responded: "I've still got the memo from [original producer] Verity Lambert outlining what she wanted for the 50th, so I've gone with that." Then he answers more seriously, saying there are "things we have been setting up for a very long while that we'll be resolving in the 50th and Matt's final episode. But the most exciting idea is obviously the one we've just come up with." Smith says he's determined to make the 50th anniversary episode "a real belter." Moffat contends that the Doctor "doesn't know he's the hero." And he would be very surprised to find out there's an adventure serial about him. "He just thinks he's larking about trying to find a fairground." Someone asked Moffat if his era was influenced by the late-1980s Cartmel Master Plan, which included a huge new mystery for the Doctor. Moffat said he never knew what that plan was, and what was supposed to happen. "I liked that era, and I liked the idea of the Doctor being mysterious," says Moffat. "I don't know what he planned... I like the idea that he's powerful and mysterious and a bit remote, but beyond that, not especially." Someone asked which Who character these actors would like to play. Smith would like to play the Master, because it's "quite meaty." And Jenna Coleman would like to play Strax. Moffat points out that the Doctor's farewell to River Song is the first ever time we see the Doctor take the initiative and kiss someone, instead of being kissed. And he clearly does it "with lustful intent." Also, Moffat says, "I've written three Weeping Angel stories and they're hell to write, because you're writing a chase scene with something that doesn't move," says Moffat. Mark Gatiss talked about some of the great coincidences that have happened as part of making An Adventure in Time and Space. There was a brass pillar from the original TARDIS, that was still available for hire at the rental shop. Also, the BBC still had four Marconi cameras from the early 1960s, and one of them was still operational, and "looking through the camera was like looking back in time." They filmed the actors through it, and it really looked exactly like the original show.